Blockchain has been a buzzword for the past few years, thanks to the rise of cryptocurrencies that are mostly built on blockchain technology. What blockchain does is essentially distributes data storage across multiple points and makes sure that each transaction or entry is being locked and secure. This makes it virtually impossible to hack or modify anything within that digital data ledger without everything in the system being affected by that change. This provides total transparency and automatic fraud protection. Many industries, beyond Financial Services, are slowly beginning to transform thanks to this technology that seems to be coming down to us from the future — just in time for the accelerated global consciousness shift. Here are a few major industries that are in the process of implementing blockchain: Education, Digital ID Management, Messaging, Charity, Cloud Computing, Internet of Things, Energy, Publishing, Real Estate, Healthcare, Insurance, Supply Chain Management (here comes.. fashion! ), and even the Government! After financial systems, education and government that are starting to be totally transformed by this decentralized technology. 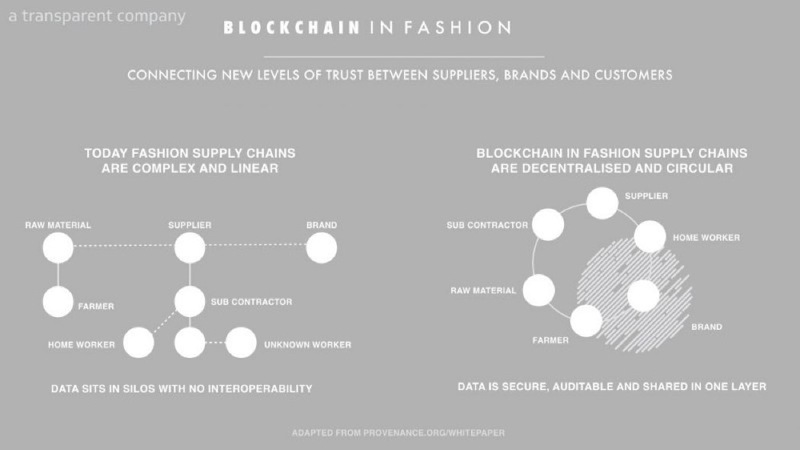 I’m especially excited about the changes blockchain can bring to the fashion industry. I believe that steps forward by a few top fashion corporations to collaborate and adopt blockchain as a group and make a standardized product lifecycle tagging system will help trickle this technology down at a geometric progression. If this happens, the fashion world will become unrecognizable and just what we envision it to be: transparent, authentic, ethical, sustainable, circular, personalized and with an excellent and engaging consumer experience on top of it all. Shopping won’t make us feel guilty ever again, it will be fun, educational, and rewarding. I am positive by nature, so I see this as a totally realistic vision, achievable within the next 5–7 years, considering the accelerated speed of technology application and shift in our collective consciousness that is taking place across the planet. In this article series, I’m going to dive into the ways blockchain can help the fashion industry become more sustainable and efficient by looking at each aspect of the fashion product lifecycle. In the first part, I’m going to focus on pre-consumer stages (when the product hasn’t reached the consumer yet): production and supply chain transparency, design/product authenticity, and distribution and inventory control. In the second part of this series, I’m going to explore the ways blockchain can be applied in retail innovation, customer feedback, and circularity. Bare with me as we’re diving deep into some technical aspects in this article series. Transparency in fashion is close to non-existent, and the only tool customers have to look up a source of where the garment was produced is a simple “made in” label, which can be deceiving. Many brands I’ve personally came across during years of working in the industry would do the majority of a garment production elsewhere and then ship items 80% complete to their local city to finish it there, which would allow them to put “Made In fill in the blank” cool-sounding city to appeal to their customers. Blockchain technology could allow brands and their customers to review every step of production and be assured that the information is accurate since it’s protected by this secure, decentralized data storage solution. The lack of transparency in the fashion supply chain has been on everyone’s lips in the past few years, especially triggered by the collapse of Rana Plaza in 2015, a garment factory in Bangladesh. Most of us do not know the real origins of our clothing and definitely are not aware of all the stages a garment goes through before reaching a store shelf. Today, with an incredible push from Fashion Revolution and their campaign #whomademyclothes, a customers movement that requests brands to respond with photos of their garment workers, holding an image of #imadeyourclothes hashtag raised the level of awareness about the issue, that is beyond fashion industry professionals. Blockchain technology is one of the very few technologies out there that has a capacity to make production cycle more transparent. I’m not an expert in supply chain, so to help me answer key questions I had on this topic I spoke with Neliana Fuenmayor, the founder of A Transparent Company. She worked on a well-known project in collaboration with Provenance and Martine Jarlgaard, that proved “blockchain’s potential for forging greater trust in businesses along a fashion supply chain, enabling brands to provide verified information about the materials, processes, and people behind products.” The first garment in fashion history that was tracked with blockchain technology was presented at the Copenhagen Fashion Summit’s ‘Solutions Lab’ in Denmark in May 2017. After registering raw material (ethically trimmed alpaca sheering) on the blockchain via the Provenance app, which was registered through all consecutive steps in production: from spinning the yarn to knitting it into a garment in Jarlgaard’s London studio. This process created a digital history of the garment’s journey. After a sample transparent production process described above, a unique digital token is assigned to each garment which enables technology providers, like Provenance to create a digital history of each step taken to create this product, with such specific data as location (name of the factories) and times. This information is presented through the app, which anyone who later interacts with the garment, can access through QR code or NFC-enabled label. This is the first proof that blockchain technology is the answer to achieve total transparency, as soon as bigger companies start incorporating this technology into their supply chain and collaborate on a universal tagging system. This historical data acts as a proof of origin and authenticity which is essential for the next issue of Fashion Industry that is screaming for a technology-supported change: counterfeits. It is clear that product authentication is a natural extension of transparency, described above — once a brand incorporates supply chain tracking with blockchain and will be able to offer their customer an insight into the complete journey of a product, fakes will cease to exist, as those companies won’t be able to hack into the secure blockchain network or to mimic the complex and detailed production journey of a real item. This technology will naturally prevent any duplication, as a unique digital authenticity ID or a token is assigned to each SKU. Once the product is purchased, this transaction will be recorded in the product’s token — so that product is assigned to a single customer, and in the future can be resold to another customer, who will then claim the ownership. Fraudulent activities cannot gain access to replicate this unique token thanks to blockchain’s secure decentralized data storage system. There are still very few blockchain experiments that focus on the issue of fashion counterfeits. Fashion brand Babyghost experimented with BitSE and VeChain. BitSE is a blockchain company and VeChain is a product management solution which is integrated with blockchain technology. Each product from Spring/Summer 2017 collection was embedded with VeChain Chips having unique identity codes that were stored on Blockchain. This allowed potential customers to learn about the story behind the garment and gauge the proof of product authenticity via a special phone app. This sounds unpractical to me since it adds a substantial friction in the customer shopping experience, but I’ll dive deeper into the customer-facing experience in the second part of this article series. A London-based blockchain startup Block Verify claims to be potentially applied in such diverse areas as pharmaceuticals, luxury items, diamonds, and electronics. Their technology is trained to identify counterfeit products, track diverted goods, stolen merchandise and fraudulent transactions. De Beers, the world’s biggest diamond producer utilizes Everledger blockchain-based technology to track the source and verify the authenticity of the diamonds at each point of distribution. Seal is a Dutch company that has also developed blockchain tech for anti-counterfeiting and theft prevention, and it provides such additional services, as product analytics and monitoring distribution. Digmus is a Russian-based startup that claims they developed an authentication technology applicable to any industry. The largest scale (to this date) use of blockchain technology to prevent counterfeiting is being developed by Chinese e-commerce giant, Alibaba. Currently, they’re testing this technology on their food products, which is also a big industry for counterfeits in China. Even for a fashion tech futurist like me, it’s difficult to imagine what decentralized data storage system that is blockchain can create for distribution/logistics, warehousing and inventory control. How about a fashion world where the stock is so smart it will decide when it’s low enough to go ahead and send replenishment requests directly to the production floor (hopefully, located nearby)? This can happen if a universal pathway is created between retailers, brands, and manufacturers. In addition, customer feedback can be communicated back to the brands and necessary product adjustment requests, such as color, prints, fit, design details, will be automatically sent to the manufacturers when it’s time to replace and improve the stock. It does require a robust Artificial Intelligence involvement, as any other aspect of fashion product cycle, but I’m talking about the potential technology, perhaps 5–7 years ahead. You may ask, but how blockchain will help achieve this potential? Again, it all comes back to the distributed nature of data storage on blockchain. In centralized systems that most inventory management technologies use there’s only limited visibility and insight into where all products are at any given moment. With a distributed system, each transaction is monitored and distribute, which prevents data to leak, be tampered with or removed without this transaction to be tracked across the whole system. This also allows agile and secure data collection, immediate data extraction for product insights and a seamless and transparent communication between the retailer, supplier, and manufacturer. In the next article in this series, I’m going to cover consumer-facing and post-consumer fashion product lifecycle stages that will be transformed by blockchain technology. Stay tuned.